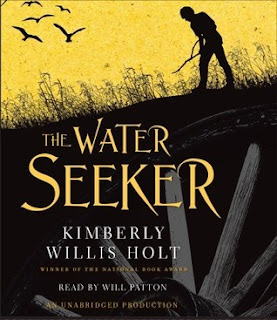 Kimberly Willis Holt is known for tackling unique subjects well, and THE WATER SEEKER is nothing if not unique. But it’s also a story as deep and as pure as a good well. It’s a story of family, persistence, courage, fear, and enduring love. THE WATER SEEKER is atypical young adult fiction in that it begins before the main character (Amos) is born and ends when he is a grown man with a child of his own. Amos is not a perfect person. The people he loves aren’t perfect either, nor are the people who love him (sometimes these aren’t the same people). But that is part of what makes this incredible story so believable. Another reason this is such a believable book is that it is a work of well-research historical fiction, perfect for the person who is interested in learning about early American pioneers. I have a lot of pioneering ancestry, and I felt such a kinship to my predecessors as I read this book, not only because I learned a lot about what life might have been like for my ancestors, but because “family” is such a strong theme in this book, one can’t help but reflect on and appreciate those who have gone before us. The prose in THE WATER SEEKER is spare, and perhaps because it is so spare, it is also utterly striking. One of my favorite images comes from a segment of the book where Amos is a part of a wagon train heading West from Independence, Missouri along the Oregon Trail. Many of the pioneering families brought treasured pieces of furniture with them in their wagons, but soon realized their loads were too heavy for the trip. Amos sees a string of pianos, trunks, chifforobes, and chests lining the trail, which cuts through a sea of tall, green grass. Heartbreaking and gorgeous.